Whatever happened to the Templars’ treasure? … in England, at any rate, the king took it. Or at least he took some of it. At Temple Bulstrode in Buckinghamshire, the Templars had a ‘tabula’ (a wooden panel or board) with holy relics in it, and a silver gilt thurible or censer. When the Templars were arrested in January 1308 and their property was valued by the sheriff of Bucks., Gilbert of Holm, the reliquary-panel and the silver censer were put to one side. 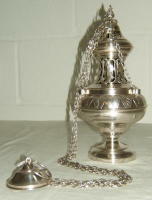 The king instructed Gilbert to hand these valuable items over to the keeper of his wardrobe, Ingelard of Warle, and Ingelard was told to put them in the king’s chapel. And there they would have stayed. So, do these pieces of Templar treasure still exist? The reliquary would have been destroyed during the Reformation. But perhaps the censer survived?